Any pool will never be complete without a trustworthy heater, especially when the colder seasons arrive and when you want to open your pool early with the help of the best pool heater. If you want to make sure that you’re maximizing the use of your pool, it’s best to secure your pool heater as early as possible. Fortunately, we've got the ultimate swimming pool heaters lineup just before the next swimming season. As much as a one-size-fits-all situation is the most ideal, finding the best water pool heater for your specific needs can be tricky. You can go for so many different kinds of pool heaters available in the market, but you can only find the best one for you after reading this list of pool heaters. Check out our pool heater ratings for an easy way to evaluate them! The Dept. of Energy says gas-fired pool heaters remain the most popular, but depending on climate and usage, they are not necessarily the most efficient. Other sources of energy include natural gas, propane, solar, and there are also electric heat pumps. Cost will vary depending on the brand you’re getting as well as its energy output (BTUs). It’s also best to check how efficient it is beforehand, how much time it will take to heat up your pool, and what this will mean for your overall costs. However, if you really want an efficient way to warm up your pool check out these best solar pool covers or these awesome pool cover reviews. Back to the choice of heaters in terms of value for money, take propane or natural gas pool heaters, for example: they are by far the cheapest option if you consider the initial costs but they will cost you more over time. This is why they are perfect if you don't need a pool heater that often. Solar pool heaters can cost you a good chunk of money initially. If you live in a sunny area, however, solar heaters will heat your swimming pool for free and with very little maintenance. As always, those of you who can afford to install a more expensive option from the start will save the most money in the long run. When reading about pool heater facts and features, you should also check what’s being said about how easy or hard it is to use. Check if you need to assemble anything, and what type of maintenance work you need to do. You should also be aware of how you can manage swimming pool temperature for energy efficiency. Searching for the best above ground pool heater can start with going for brands that have a great track record. You should also look at how durable a product is and what others are saying about their experience with it. You want to end up with an efficient and effective product that can actually heat your pool, but also one that will last you a long time. Check if the company offers free shipping, and if you can get some help with installation if you need it. You must also check the warranty terms and conditions. If you were to return the product or request for it to be fixed, how easy will this be for you? Many people get a heater and a pool heat pump mixed up and it's easy to do because they are so similar in form and function. We also encourage you to look at a pool heat pump as an alternative! So what has changed on the market compared to the pool heater reviews 2017 and 2018? A lot! We now have super-efficient, reliable and long-lasting models to review before the new swimming season. Read about our top rated pool heater units to date, which will help you make a sound decision. Keep your pool as well as your specific needs in mind so you can make the most of these reviews of the best rated pool heaters on the market! The Hayward Universal H-Series Low 400,000 BTU natural gas residential pool and spa heater is one of the best pool heaters out there, giving you the best in advanced technology and flexibility. It has a patented polymer header design, which is able to give you hydraulic performance and reliability like no other. This saves energy and protects the unit from the damaging effects of high flow conditions. Aside from that, you also get a forced draft combustion system, which means the air is moving at a precise flow rate through the combustion chamber. With this constant flow, all other weather variables (i.e. high wind conditions), which tend to be unpredictable, have almost no impact. ​Other heaters can actually be affected greatly by weather conditions, making this a big plus in our evaluation. Because of its highly resilient and state-of-the-art Cupro Nickel Finn Plate Heat Exchanger, you can rely on this pool heater when it comes to longevity. It will remain durable and resilient even in salt-based, aggressive, and high-flow conditions. This unit has a Hayward Universal design, which makes installation easy and versatile. With its many years of experience and vast product range, Hayward knows exactly how to design the best gas heater that will suit your needs. The L.E.D. digital control panel makes everything easier and more intuitive. This accuracy you get with digital controls actually saves a lot of time, money, and effort – because it means you don’t have to spend so much time figuring out how to adjust the pool temperature to reach the optimum one. Another unique selling proposition that this unit has is its ability to produce low nitrogen oxide emissions. That means it’s environmentally responsible, and it’s ideal for all low NOx regions. You get to enjoy your heated pool water with peace of mind because thisDur meets, if not exceeds, all the air quality emission standards in these regions. Based on the efficiency range that similar models have, this unit’s 83% thermal efficiency is actually at the lower end and can still be improved. Some gas heaters go as high as 89-95%, wasting less fuel. Most users are generally satisfied and really happy with this product, it’s unlikely that you’ll need to use your warranty. However, it’s best to be aware that this only gives you a 1-year warranty and if anything needs fixing beyond that time period, you’ll have to deal with it yourself. Bottom Line: The Hayward Universal H-series is a great choice for anyone who lives in weather that has a lot of variation. It's easy to install and use, and has no nitric oxide emissions which is a huge plus! Like with Pentair, Hayward is a great brand and we have a ton of other Haywards pool heaters reviews. The Smartpool Sunheater is hands down the best solar pool heater available, but is not an actual heater. Instead, it is just a cover used to help heat the pool. This solar heating system has 80 square feet of solar panels, and each panel array measures 20 feet long and 4 feet wide. Unlike a heater that uses electricity or a gas pool heater, this one’s great because you get to warm up your pool through a polypropylene heat collector, and primarily using the sun’s energy. The Dept. of Energy calls solar pool heating ‘the most cost-effective use of solar energy in many climates’. Swimming pool heating can be expensive, but by installing this solar pool heater, you get to significantly reduce your heating costs. That’s because you’re using the energy of the sun instead, so you get to save significantly on annual operating costs. Even for those who are not yet too familiar with solar heating, it won’t take much time and effort to get the hang of this. It’s an easy installation that will only take a few hours, depending on how big your swimming pool is. However, if you really find the instructions difficult to understand then you could also have a pool company help you out with the installation. This product gives you an efficient way to heat your pool without harming the environment. If you have really have to heat your pool constantly, especially during the winter months, then having a great solar heating system like this one will allow you to do that without feeling like you’re consuming so much electricity or fuel. Another great thing about this solar powered heater is that it can raise the pool temperature by a couple of degrees, even better than a sub par pool heat pump or other heaters. It also stays that way longer through the night, so you can really enjoy this especially during winter. In order to use this solar heater, you’ll need to buy an installation kit, which is sold separately. Some people have been able to install this without the kit, but it involves buying your own hoses, connectors, and clamps. This was designed specifically with in ground pools in mind. While it works perfectly for in ground pools, you won’t really have much use for this if you have an above ground pool. For that, you’ll need to have the proper piping. Bottom Line: If you're looking for a solar pool heater then look no further as it doesn't get any better than Smartpool's Sunheater. Efficient and effective, it's everything you want in a pool heater and more. You can't go wrong with this purchase if you have an inground pool. With an 83% energy efficiency rating, the Pentair MasterTemp natural gas Pool Heater is one of the best pool heaters you can get in the market today. This is powered by gas and is specifically engineered for safe and easy operation, so it’s actually as easy to use as your home heating system. There are indicator lights and intuitive controls that make it easy for you to tinker with the settings, but there are also built-in safety features that make things even easier. This propane pool heater can be used for small in ground pools, above ground pools, and spas as well as your hot tub. It has high-technology features that contribute to its high quality performance, giving you similar features that you can find in larger in-ground heaters. This comes with an information-rich digital display and control pad that’s super easy to use, making it convenient to program and monitor. You can rotate the display for any installation orientation, so you can really maximize it for your benefit. The thing with pool heaters is that they’re typically exposed to anything and everything, so if you have something flimsy you might as well say goodbye to it. What’s great about this is that it’s made to withstand the harshest of the elements, and you get a tough rustproof composite exterior that can handle anything that’s thrown at it. The housing is resistant to corrosion and UV rays, so you can really count on this to be durable and to last you a long time. The push-button digital controls are easy enough to operate so you don’t have to worry about pressing the wrong thing. Aside from that however, the safety is increased because of several built-in measures that the manufacturers have thought of. For instance, a stack flue sensor guards against overheating and high limit switches are there to sense if temperatures exceed the set limits. Finally, you'll notice that we have a lot of comments about Pentair pool heater - Pentair is one of the biggest and best names in the pool business and they have a brand you can really trust. This 125,000 BTU heater only works for smaller bodies of water up to 15,000 gallons, meaning a smaller pool, a spa or a hot tub. Beyond that, you wouldn’t get your desired results and it’s no longer as efficient. This means that if you have a bigger pool, you’ll have to get a heater that has a bigger capacity. This is powered by natural gas, which works well if you already have a gas line up that’s 50 feet away and easy to link. However, this might be an issue for some, and you might need to make extra arrangements in order to ensure that your pool heater is properly connected to a gas source. 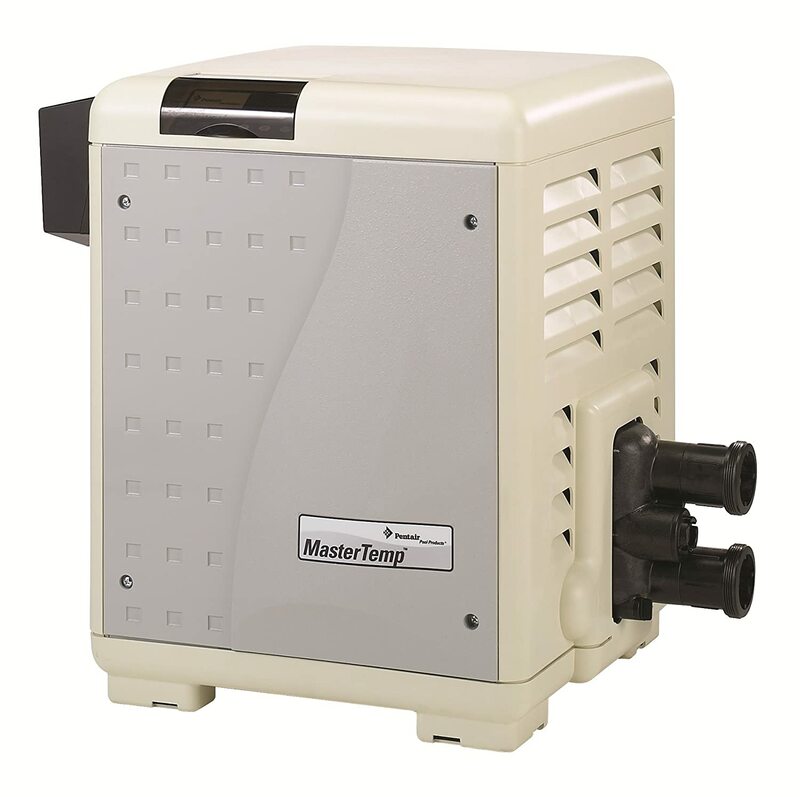 Bottom Line: There is a lot to love about the Pentair Master Temp Pool Heater. It's one of the best types of pool heaters in the list because it is everything you could want in a swimming pool heater: performs well, easy to use, and durable. This is a must have. The Pentair 460736 MasterTemp﻿ 400,000 BTU heater is a top pool heater option you can go for in the market today, and is also one of the most powerful. At 25x30 inches and only 120 pounds, this compact and lightweight heaters is also certified for low nitrogen oxide emissions and meets strict air quality standards. This Pentair heater is perfect for clean air enthusiasts! You don’t have to spend any additional time figuring this out because just like your typical home heating system, this one’s quite easy to operate. You also get indicator lights as well as a rotating digital display that’s easy to view, placing your digital controls in a convenient location. This makes everything much easier to manage. Safety is an important concern when it comes to pool heaters like this one, so it’s really great that his comes with high limit switches that automatically turn off when the water temperature exceeds safe factory-set limits. A stack flue sensor and water pressure switch prevent the unit from overheating. You also get a manual gas shut-off when service is required. Another feature that many users have noticed works really well is this unit’s ability to heat up the pool faster. More importantly, it is engineered for quiet operation so you don’t have to deal with a lot of unwanted noise. Compact and durable, this pool heater comes with a cupro-nickel exchanger that can stand up to the harsh conditions. Whether its high flow, heavy use, or even low pH, your unit need not suffer. Also, the exterior is tough and rust-proof so it can definitely handle the weather elements. With a powerful unit that has 400,000 BTUs, you’ll need a significant flow of gas to keep this running. This is something you must check with your gas provider, because doing a load survey on your home’s usage might be helpful prior to setting this up. 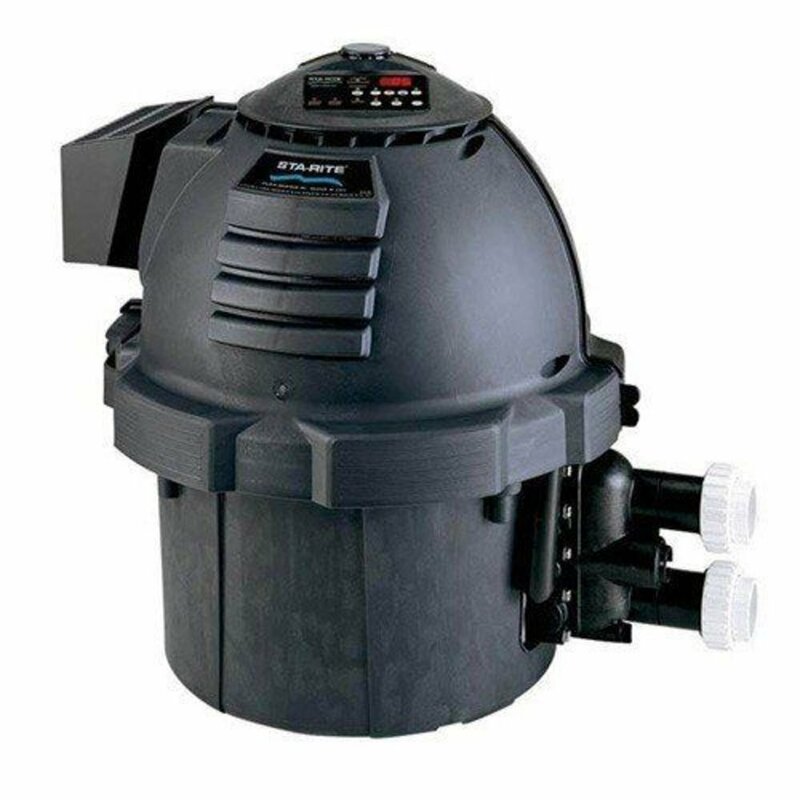 This may not be as ideal for smaller pools with smaller ¼-½ circulation pool pump, because the unit itself will not fire up if you don’t have at least a 38GPM flow of water at all times. This is true even for the heater’s cool down period. Bottom Line: The Pentair MasterTemp is a decent pool option for those specifically looking for heaters that use natural gas. There are better choices available, but this won't disappoint either. Specifically made for faster and more efficient heat-ups, the Sta-Rite Max-E-Therm propane heater is ideal for residential use. It is certified for low nitrogen oxide emissions, outperforming industry standards when it comes to air pollution exhaust. There’s a temperature safety lockout, and the PMG burner technology also allows you to use this even without an outdoor draft hood. Weighing only 138 pounds and measuring 34 x 32 x 27 inches, this pool heater is the lightest in its class, thanks to its compact design. This makes it ideal for retro-fit installation, so it can easily fit in even if you have an existing system. You can enjoy this with significantly lower operating costs, thanks to its 84% efficiency rating. This pool heater is actually rated 1st in its class for highest energy efficiency, so you’re assured that there’s not too much waste and you’re really getting your money’s worth. This pool heater is housed in a sleek enclosure that has a black, matte finish. This housing is completely rust-proof and made of exclusive Sta-Rite material, so you really know that it’s able to weather all the elements, including heat. It clearly does not sacrifice form for function, because it’s sleek and durable at the same time. While you need a professional to install this, once it’s running, the controls are almost effortless. You get a LED temperature readout with dual thermostat controls, but also a 6-position control panel and PVC union connections. The digital display is designed as large format, and it also contains indicator lights. This makes it easier not just to control but also to troubleshoot if needed. This powerful pool heater works in all aspects, but you need the help of a licensed installer to get it up and running. The user manual is there of course, but the warranty becomes void if something goes wrong during installation and it wasn’t done by someone licensed. Before running the pool water through the heater, you might want to get a separate filter/pump system or diverter in order to ensure that the chemicals are at the correct levels. This is because the warranty becomes void if the unit becomes damaged and the cause is chemical imbalance. Bottom Line: Sta-Rite Max-E-Therm's heater is decent, but overall isn't worth it. The overall performance is just average - you can do better, but this is a decent choice if you really want to get it for some reason. This Raypak pool heater review will focus on this digital pool and spa heater, which is powered by natural gas and has 336,000 BTUs. Its thermostat is controlled by a microprocessor, and this allows you to set the temperature digitally. It's not a top pool heater, but it does the its job. The heater itself has polymer headers, PolyTuf powder coating, and an all copper-fin-tube heat exchanger. Not all heat exchangers are this good, I'll tell you! It’s made of non-corrosive and rust resistant materials, including a stainless steel tube sheet and 2-inch CPVC water connections. Because it’s digital, you can set the temperature beforehand and literally forget about it. This means you can enjoy your time in the pool without having to think about the heat settings. The cabinet and the internals are resistant to rust. It also has a wind-resistant design that protects itself from the weather’s unpredictability. This Raypak pool heater remains functional even if the wind blows too hard or you’re suddenly experiencing sleet or snow. This one has a thermal efficiency of 82%, which is at the lower end of the efficiency range of similar models. This rating is given by the Dept. of Energy, which says you can now find gas pool heaters with as high as 89-95% efficiency. An 82% efficiency rating means you’re wasting 18% of your fuel. Operating on 120/240 volts, this 336,000 BTU unit is designed only for residential use. This means you can very well use it for your backyard pool, but you can’t rely on this product much for commercial purposes. Measuring 41 x 31 x 31 inches and weighing a total of 230 pounds, this is one of the heavier pool heaters out there. You must consider this in terms of where you want it delivered and whether or not you need help with installation, because it can be too heavy for some. Bottom Line: This Raypak Pool heater is okay, but there are better heaters out there and other Raypak pool heater owners will agree. The Zodiac Jandy LXI clear controls and easy-to-use interface, this natural gas heater is great for heating your pool and spa. Users enjoy the fact that it’s wired and designed simpler. Because of its efficiency, you get to save several hundreds of dollars in cost. Despite all this it still misses as one of the best pool heaters. One of the best things about this heater is that it exceeds the environmental standards set for low NOx emissions, so it’s really great for the environment. This means that as you enjoy your pool heater, you can also rest in the fact that you’re not being harmful to the environment. This comes with a control panel that’s rich in features and friendly to all users, so you won’t be wasting time trying to figure out all the difficult controls. The menu has been simplified for ease of use, and the backlit display makes everything easy to read and understand. This also comes with a built-in one-touch automation system that makes it easy to switch from pool to spa. This heater measures 43 x 36 x 30 inches and weighs 161 pounds (227 pounds in shipping weight). It’s not as lightweight and compact as some other heaters in its range are, so this may cause problems with handling. While it’s not a deal-breaker, this is certainly an area of improvement. Some Jandy pool heater reviewers tend to be negative so we're not the only ones who have a less than stellar experience with Jandy. While this pool heater is energy efficient, you should just be aware that it runs on natural gas and you have to ensure that you’re connected to a proper source. It works if you already have natural gas powered objects in your home, but you can consider electric pool heater or a solar heater otherwise. This heater communicates with the AquaLink RS family of controls, so if you already have this system then all the better for you. There are some users however who have encountered problems with switching from the Pool or Spa, and that’s probably because the new panel and old panel aren’t automatically compatible. You’ll need to download the manual to identify which panel you have, or call customer service for support. Bottom Line: This Zodiac Jandy heater is not worth getting. You can do many better heaters for a similar price. You've been warned. DO NOT GET THIS.